1. COMPLEX BINDERS SYSTEMS BASED ON MINERALOGICAL HIGH REFRACTORY COMPOUNDS/ Nicolae ANGELESCU, Sofine AMZIANE, Cristina IONITA, pp. 7-10. Abstract. This paper aims to present the achieving a complex binder systems with high mineralogical refractory compounds. For achieving this purpose there were sintered two types of alumina cements based on CA2 and CA6, compounds with the highest refractoriness from the Al2O3-CaO system. 2. METAL-CERAMIC COMPOZITES/ Nicolae ANGELESCU, Ioana ION, pp. 11-14. Abstract. Cermets belong to the composites structurally integrated, obtained from a metal or alloy (respectively from more alloys or metals) and one or more ceramic phases. The compound ratio (metal and ceramic) may vary a lot, and the cermet process runs at high temperatures, in a protection antioxidant atmosphere. 3. SYNTHESIS AND CHARACTERIZATION OF HYDROXYAPATITE OBTAINED IN DIFFERENT EXPERIMENTAL CONDITIONS/ Nicolae ANGELESCU, Dan UNGUREANU, Violeta ANGHELINA, pp. 15-18. Abstract. In this paper we present a synthesis method for obtaining hydroxyapatite nanopowders by chemical precipitation. As the starting reagents, analytical grade Ca(OH)2, H3PO4 and NH4OH were used. In order to study the factors that have an important influence on the chemical precipitation process a experimental platform has been designed for hydroxyapatite synthesis. The experimental platform was designed and developed in order to study the factors involved in chemical precipitation reactions of hydroxyapatite such as synthesis temperature, stirring speed, acid addition rate, aging time of precipitates etc. The proposed method led to obtaining a hydroxyapatite with a high degree of crystallinity. In order to investigate phase composition, crystallinity and crystallite size, the thermal treated powder samples has been characterized by X- ray diffraction. 4. STUDY ON ELEMENTALS ANALYSIS PERFORMANCES OF NAA TECHNIQUES ON AISI 316L STEELS/ Florina Violeta ANGHELINA, Elena STOIAN , Veronica DUMITRESCU, pp. 19-21. Abstract: Knowing the exact chemical composition of a metallic biocompatible material is a major requirement for estimating the behavior of implant inside human body. In this direction the conformity requirements for biocompatible steels AISI 316L are specified in the SR ISO 5832-1 standard. This paper aims to provide information on capabilities of complementary techniques like NAA (Neutron Activation Analysis) for determining of a extended number of elements in AISI 316L steels. 5. ESTIMATES OF UNCERTAINTY IN OPTICAL EMISSION SPECTROMETRIC METHOD WITH ARC AND SPARKS EXCITEMENT (SEOASE)/ Florina Violeta ANGHELINA, Vasile BRATU, Ileana Nicoleta POPESCU, Dan UNGUREANU, pp. 22-26. Abstract: The practice of technologically advanced countries and economic default and the current rules of the European Union (EU), all measurements have undergone a significant process of standards to ensure quality undisputed of the test results. In the spectrometric field there are standards of competence of laboratories, as well as of analytical method. SR EN ISO / IEC 17025, EN 13005 and European standards 04-16 EA, ILAC, etc. 2000. clearly specified scientific substantiation of the measurand to be modeled properly and to prepare the budget of uncertainty in knowledge. In this context, to estimate correctly the measurand spectrometric test is necessary to specify the current state of theoretical modeling of radiation emission by atoms. It is clear that attempts spectrochimice are affected by a relatively large number of influencing factors, which generates errors and thus contribute to the uncertainty budget method, in a way difficult to estimate. Accuracy and reliability spectrometric tests and / or calibrations performed by a laboratory are determined by many factors. These factors will be estimated and analyzed in this paper. 6. ACOUSTICAL DETERMINATIONS ON A COMPOSITE MATERIALS ( EXTRUDED POLYSTYRENE TYPE/ CORK)/Polidor BRATU, Georgiana Luminita ENACHESCU, Mihai Catalin ROSCA, Ovidiu VASILE, Radu I. IATAN, pp. 27-32. Abstract. In this article we obtained some experimental results of the extruded polystyreneand and cork. They are absorbtion coefficient, reflection coefficient, impedance ratio. All these are necessary for extracting some properties of extruded polystyrene and cork wich are using in auto industry, plane plates construction etc. 7. IDENTIFICATION OF SOURCES AND NATURE OF POLLUTANTS SPECIFIC TO SIDERURGICAL PROCESSES GENERATING ENVIRONMENT IMPACT/ Ilie BUTNARIU, D.FLORESCU, pp. 33-36. Abstract. The paper presents the principal sources of pollutants in siderurgic industry, nature of these pollutants and the effects they produce against environment. This analysis is made by steps of technological flux specific to each procedure of elaboration of siderurgic materials. 8. ASPECTS CONCERNING PRODUCTION OF DEFECTS OF SUPERFICIAL FISSURES TYPE IN CONTINUOUS STEEL CASTING/ Ilie BUTNARIU, pp. 37-39. Abstract. In this paper, there is shown the mechanical process for the making of the superficial fissures to the continuous cast slabs by high strong steels. Also, there is presented the influence of the structure non-uniformity and chemical steel composition in the fissures making process. There are presented the principal measures for the prevention of appearing of the superficial fissures. 9. REALIZATION OF THE MOULDS REINFORCED BY HARD SINTERED ALLOYS WITH SPECIAL UTILIZATION/ Emilia COMAN (CIOVICA), pp. 40 - 46. Abstract. The fabrication of assembly mechanisms is usually based on cold plastic deformation of half-finished steel products in moulds reinforced by hard sintered alloys. A special category of moulds are those used in cold plastic deformation of car pivots and tappets, where the deformation ratio and the products configuration generate maximum stresses upon deformation tools-resulting in their premature failure. The paper presents some particularities of the technology of manufacturing the moulds reinforced by hard sintered alloys the improved technology results in a perceptible increase of their reliability. 10. EXPERIMENTAL RESULTS FOR BENDING FATIGUE BEHAVIOUR OF GLASS-EPOXY COMPOSITE MATERIALS/ Adrian CATANGIU, Alexandru Traian DUMITRESCU, Dan UNGUREANU, pp. 47-51. Abstract. The paper presents results obtained by bending fatigue tests of specimens obtained from composites plates of ortogomal glass fibers woven and epoxy resin . The samples from plates obtained by hand lay-up method were tested by using a bending fatigue testing machine built in university lab. As a degradation parameter was considered the relative reduction of Young modulus values. The test results revealed a samples fatigue behaviour better as the proportion of fiber oriented along with sample longitudinaral direction is higher. Also from tests results can be pointed out that on the degradation firsts stages have been observed cracks in samples which have fibers with orientation different to longitudinal one, cracks which we consider are related to the inherent defects due to the used fabrication method for composite plates, too. 11. PERFORMANT INSTALLATIONS FOR DRYING AND HEATING THE STEEL LADLES/ Dan JILAVU, Valentin RIZEA, Aurel GABA, pp. 52 - 62. 12. THE CONTROLLED ATMOSPHERE INFLUENCE OVER THE ASPECT OF THE STAINLESS STEEL STRIP Bogdan Alexandru MOISA, Andrei CHIRAN, Ionut PRICEPUTU, Zorica BACINSCHI, pp. 63 -70. Abstract. The aim of this paper is to study the controlled atmosphere influence over the aspect of the stainless steel strip The use of continuous style, controlled atmosphere bright annealing furnaces to heat treat stainless steels after cold rolling is becoming more common as the aerospace and automotive producers increase the use of stainless steel components on existing designs and explore new designs. Although much of the metallurgy and thermodynamics of Iron, Chrome, Nickel and their compounds are well understood, a review of the application of the fundamentals to the current practices and equipment technology can help with improved product quality, expanded applications, and the optimization of costs for a net improvement in competitiveness. 13. NEW BIONANOPARTICLES AND THEIR APPLICATION IN NANOMEDICINE/Daniel MUNTEANU, Rodica-Mariana ION, pp. 71 - 74. Abstract. Biomedical nanotechnology presents revolutionary opportunities in the field against many diseases such as cancer, neurodegenerative diseases, as well as detecting microorganisms and viruses associated with infections. There has been enormous interest in the field of preparation of nanostructured advanced materials by physical methods have become an important branch of high technological materials. In this paper the use of nanocomposites of inorganic materials in organic matrices or photosensitizer-stabilised gold or silver nanoparticles for photodynamic therapy of cancer, is presented. A combination between typical properties of organic polymers (specific absorption of light) with the advantages of nanoparticles, particularly the high specific surface and the high ratio of surface atoms to inner sphere atoms, is discussed. For both types of nanoparticles, gold and silver, the changed topography of the film surface after deposition is caused by a local material transport and a material separation between formed particles (probably AgNO3) and the embedding polymer matrix. It is assumed that small particles of Ag are formed by a thermal redox process between Ag+ and the polymer. The structure of the prepared hybride nanocomposites by means of X-ray diffraction, IR, XRD, XRF and optical spectroscopy, etc. will be evaluated. 14. SOLUTIONS AND MODERNIZATION OF HEATING FURNACE INDUSTRY STEEL MATERIALS/Dorian MUSAT, Aurel GABA, Vasile BRATU, Marian IONESCU, Mihai UDRISTE, Ionel DOBRE, pp. 75 - 82. - a facility use automation to meet the technological requirements and environmental energy, provided with a PC. To forge furnace in the two cases analyzed, modernized and upgraded to create a mathematical model for performing energy balances. The mathematical model developed was implemented in a Microsoft Excel program with the author that have been prepared using data obtained from thermal balance measurements of forging furnace before and after modernization. By comparing data from the program emphasizes increasing energy and technological performances of forging furnace under study after modernization. The experimental results obtained in the operation of this oven upgraded without running the air preheater, are presented in the paper, along with overviews of the cabinet and the various installation made. 15. THE EFFECT OF WEAR TEST PARAMETERS ON TRIBOLOGICAL CHARACTERISTICS OF ALUMINUM BASED COMPOSITES/ Ileana Nicoleta POPESCU,Vasile BRATU, Florina Violeta ANGHELINA, Lucica-Grigora TOMA, pp. 83-86. Abstract. In this paper we examined the effect of contact pressure (applied load) and relative speed in braking points on the coefficient of friction and wear of aluminum composites, sintered at 620°C for one hour in hydrogen atmosphere and after that solution treated at 515±5o C for 6 hours, quenched in water and artificial aging at 170° C for respectively 8 and 4 hours. The obtained values of tribological characteristics for studied composites (Al-4Cu/10% and Al-4Cu/15% SiC )compared with Al-4Cu alloy material and with another import sintered friction material, tested under the same conditions, shows that if the applied load increases, wear increases for all materials and friction coefficient decreases. It is noted that we obtained the lowest wear for Al-4Cu/10% SiC material, tested with a load of 0.35 MPa at a speed of 3.8 m/s, and the highest values of wear we are recorded for unreinforced aluminum alloy. The measured fiction coefficient values are in the range of 0.4-0.5 for composite materials and the same friction coefficient values for the imported material and for unreiinforced aluminum alloy has a tendency of gripping. 16. DELTA FERRITE INFLUENCE IN AISI 321 STAINLESS STEEL WELDED TUBES/ Ionut Lucian PRICEPUTU, Bogdan Alexandru MOISA, Andrei CHIRAN, Georgian NICOLESCU, Zorica BACINSCHI, pp. 87 - 90. Abstract. Usually a percentage over 2.5% of delta-ferrite is contained in AISI 321 stainless steel which leads to better workability (welding procedures). However a percentage like 10 % of delta ferrite or more can be harmful to the welded area due to the transformation of ferrite to sigma phase (which is a specific transformation of the steel alloyed with chromium). The best way to predict de content of delta ferrite in austenitic stainless steel is Schaeffler-DeLong diagram. 17. EXPERIMENTAL RESULTS OF THE USAGE OF AN OXY-FUEL BURNER AT ELECTRICAL ARC FURNACES /Valentin RIZEA, Dan JILAVU, Aurel GABA, pp. 91-96. Abstract. Electric arc furnaces had, after the energy crisis emerged, a remarkable development in metallic materials industry. Among the procedures developed, with a major contribution in reducing the specific consumption of electricity, there is also the usage of the oxy-fuel burners. This paper presents advanced solutions and oxy-fuel combustion systems, used worldwide in electric arc furnaces. In the paper there are also described the combustion plants with liquid and gaseous fuels, mounted in the lid and on the electric arc furnace door, along with the main technical characteristics and results obtained experimentally. It also presents results obtained experimentally on an electric arc furnace equipped with an oxy-fuel burner. 18. TEMPERATURE BEHAVIOR OF LAMINATED COMPOSITE MATERIALS CONTAINING TEXTILE WASTE /Iuliana STAMATE, pp. 97-100. Abstract. Composite materials are new materials class, which is growing rapidly due to their special properties and so because of their use. Following the technological process in the textile industry, resulting more waste, in order to capitalize on their part, are made of composite laminates containing textile waste. This paper represents the starting point for the study of the temperature behavior of these composite materials laminated. 19. ASSESSING THE TOTAL PHENOLICS OF ROMANIAN WINE VARIETIES/ Rusandica STOICA , Rodica-Mariana ION, Ioana-Raluca BUNGHEZ, Raluca SENIN, Irina Gentiana BAJENARU, pp. 101-103. Abstract. Phenolic compound are ubiquitous constituents of higher plants found in the wide range of commonly consumed plants foods such as fruits, vegetables, cereals and legumes, and in beverages of plant origins, such as wine, tea and coffee (Stoica R., ). Phenolics are a large and complex group of compounds of a particular importance to the characteristics and quality of red wine. They are also significant in white wines but occur in much lower concentration. These compounds can affect the appearance, taste, mouth-feel, fragrance, and antimicrobial properties of wine. (Jackson R. J., ). Phenolics in grapes and wine include many different substances: phenolic acids, flavonoids, proanthocyanidins and polymeric condensed tannins (Waterhouse A.L., ). Measuring these different analytes and reporting meaningful value in a single number it is an analytical challenge. In this paper is described the total phenolics assessment using Folin-Ciocalteau method widely applied for the analysis of the total phenolics in wine. A global assessment of the total phenolic content of some Romanian wines was achieved. 20. METHODS FOR PREVENTING THE ELECTROCHEMICAL CORROSION ON A REFRIGERATOR COOLING SYSTEM/ Valentin-Cristian TOGAN, Gheorghe IONITA, pp.104-109. Abstract. The degradation of the metallic surface is a phenomenon that has been studied on the basis of the many experimental observations, in order to prevent or slow the destruction of the parts or equipments. Therefore, preventing the electrochemical corrosion occurrence on the refrigerators cooling system, helps to reduce the service call rate. On the other hand in the last year, the quality of the products is the most important aspect that every company tried to improve by reducing the service call rate. 21. THE MOLDFLOW ANALYSE OF THE INJECTION PARTS, AND THE IMPROVEMENT OF THE INJECTION PROCESS/Valentin-Cristian TOGAN, Gheorghe IONITA, pp. 110-114. Abstract. Processing by injection is the largest industrial way to obtain plastic parts. An analyzing accuracy of the injected part execution, improving the quality of the injection process and of course the quality of geometrical execution parts and injection process, has been performed with the new 3D simulation program Autodesk Moldflow Insight. 22. SYNTHESIS, CHARACTERIZATION AND IN VITRO BIOACTIVITY OF SiO2 – CaO – P2O5 SOL – GEL GLASSES HIGHLIGHTED BY XRD TECHNIQUE/ Dan N. UNGUREANU, Nicolae ANGELESCU, D. AVRAM, Adrian CATANGIU, Vasile BRATU, Elena V. STOIAN pp.115-119. Abstract. Synthesis of bioactive glasses can be achieved by two major methods: traditional fabrication by melt – casting and sol – gel process. Bioactive glasses obtained by sol–gel process generally reveal a high bioactivity than melt derived glasses of similar compositions.A common feature of this materials is the modification of their surface reactivity immediately after soaking in simulated body fluids. On the glass surface a layer of carbonated hydroxyapatite, biologically active, is formed. In this paper, bioactive glasses based on SiO2-CaO-P2O5 system have been synthesized by sol – gel process. The powder glass obtained has been characterized by X-ray diffraction, X-ray fluorescence spectroscopy (XRF). In vitro study reveals formation of apatite layer at surface of powder glass, after 3 days of soaking in simulated body fluid. 1. MULTI-PARAMETRICAL MONITORING OF GRINDING PROCESS FOR INCREASE PROCESS QUALITY/A. Abalaru, D. Stanciu, D. Cioboata, L. Savu, M. Cornel, pp. 121-126. Abstract. During the grinding process are generated a lot of vibro-acoustical emissions. The monitoring of these emissions is necessary for the optimization, control and keeping of the process in allowable limits. A method and an apparatus were developed for monitoring of the grinding process components: acoustic emission generated during cutting process by the contact abrasive wheel – part; vibrations generated in the abrasive wheel shaft by the unbalancing of the abrasive wheel; geometry of the part processed; geometry of the abrasive wheel. 2. MECHATRONIC SYSTEM FOR PNEUMATIC ACTUATION, USING AS EXECUTION ELEMENT, AN ARTIFICIAL MUSCLE AND FOR CONTROL LOOP, USING A CAMERA/Mihai Ardeleanu, Adriana Carstoiu, Simona Mihai, pp. 127-130. Abstract. In this paper it was conceived a system to control supplementary the accidental situations that may occur during operation of the mechatronic device with pneumatic muscles, for precise actuation loads. The system developed includes the technical work with image processing, in the static case. An interactive program is designed bellows gauge functional check for artificial muscle, checking frame by frame the pixel’s attributes arrays of compared, in comparison with the maximal state matrix. The system has the capacity to respond by sending a digital message encoded by a superior computer system. 3. SUPERVISER MECHATRONIC SYSTEM, BY IMAGE PROCESSING, FOR AIR FLOWS CIRCULATING THROUGH THE ARTIFICIAL MUSCLE IN A MECHATRONIC DEVICE /Mihai ARDELEANU, Adriana CARSTOIU, Simona MIHAI, pp.131 – 132. Abstract. Through this paper the authors propose an image processing system which, through a dynamic approach, check the flow values derived by calculation, compared with some maximum values imposed. The system warns via digital code, transmitted by a superior level computer which it is notified of the achievement of improper working parameters. Conception of system is presented in a comprehensive graphical format, with the map of the main details. 4. DETECTING THE ORIGINS OF SOME FAILURES OF MECHATRONIC DEVICES AND SYSTEMS BY NON-CONTACT, FULL-FIELD LASER SPECKLE INTERFEROMETRY/D. N. Borza, I. T. Nistea, pp. 133-142. Abstract. Embedded electronics are exposed to harsh working conditions. They are exposed to high levels of stress having both thermal and mechanical external origins, often coupled. These stressing sources may directly create reliability problems, but they may also increase the effects of other factors, such as humidity, chemical or electrical ones. The experimental analysis of such phenomena may be of great help in discovering the origins of similar failures and in developping a correct numerical model which allows further simulations and establishing credible failure scenarios. The objective of this paper is to present the practical application of a full-field, non-contact optical technique – the out-of-plane speckle interferometry – in finding the physical origins of some failures occurring in an assembled embedded board. The failures appear as solder joint shear in presence of thermo-mechanical stressing. The authors applied a multi-level experimental methodology allowing to obtain the out-of-plane deformation cartography and finally explain the possible root origins of the failures. The test methodology is able to provide an insight into the physics-of-failure. The interferometric sensitivity allows using very small thermal stress, so that they are not inducing any harm to the tested product. The results may further be compared to those of a numerical model. 5. OPEN ARCHITECTURE EQUIPMENT FOR A HIGH PRECISION MEASUREMENT AND THREE-DIMENSIONAL MODELING OF THE FREE FORM SURFACES/ D. Cioboata, A. Abalaru, C.Logofatu, F.Traistaru, D. Stanciu, Marin Cornel, pp. 143-149. Abstract. With quality control being an important issue in industry, there is a great need for free form surfaces measurements in manufacturing. With manufacturing processes becoming increasingly more flexible, there is also a demand for increasing flexibility of measuring machines. This paper describes the process of developing an automatic measurement system for any free-form surfaces. We present a system for 3D surfaces measurement with three inter-changeable measurement heads which can be easy mounted on its Z axis and allow contact or non-contact measurements. The paper presents also some considerations about error sources and system calibration. This system is developed under the project: „Researches on advanced control techniques based on the analysis of errors and three-dimensional modeling for a high precision measurement of the complex surfaces”funded by National Program Partnerships in Priority Areas. 6. STUDY OF SELECTIVE LASER SINTERING – A QUALITATIVE AND OBJECTIVEAPPROACH/Veronica Despa, Gheorghe I. Gheorghe, pp. 150-155. Abstract. This paper makes a synthetic overview of the process of selective laser sintering (SLS). At first, the SLS process was experimented performed mainly on polymers and nylon to create prototypes for audio-visual help and fit-to-form tests. Gradually, the SLS process has unfolded and expanded including metals and alloys to manufacture functional prototypes and develop rapid tooling. Subsequently, computational modeling has been used for the computer management of the SLS process, optimize the process parameters and enhance the efficiency and dialogue between the sintering machine - operator. 7. INJECTION MOULDING SIMULATION OF POLYMER STRUCTURES MODELED WITH FINITE ELEMENT /I.DURBACA, A.C. DURBACA, pp.156-159. Abstract. The paper presents the results of finite element and computer-aided simulation of injection molding process for some polymer material parts (footwear soles) in order to establish the profiles of injection rate, pressure, temperature gradient for the polymer melt in the mould cavity and distributing channels, analyze the clamping pressure during the injection, and select the best injection point in the mold cavity to avoid incomplete filling, shorter injection time per cycle etc. 8. EXPERIMENTAL STUDIES REGARDING THE BEHAVIOR OF A MECHANICAL SYSTEM WITH PNEUMATIC MUSCLE DRIVEN BY COMPRESSED AIR / Andreea IANCU, Viviana FILIP, pp. 160 -167. Abstract. The objective of the paper is modeling the behavior of experimental pneumatic muscle wich performs a translational motion, using a bench with low pneumatic pressure . It will be determinated in FluidLab, the value of the force developed by the pneumatic muscle, taking account of the pressure load, the muscle is modeled in SolidWorks and simulated the behavior, depending on the texture turns and the material it is made, the virtual model is made in the experimental stand MatLab Simulink and set new directions for research. 9. 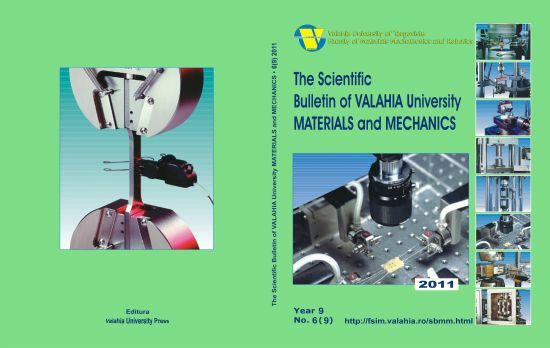 RESEARCH WORK AND STUDY ON ULTRAPRECISE HIGH-TECH ROBOTIC MICRO-NANO-SYSTEMS FOR MEASUREMENT, POSITIONING AND ALIGNMENT USED IN THE FIELDS OF MECHATRONICS AND INTEGRONICS/ Simona ISTRITEANU ,Gheorghe Ion GHEORGHE, pp.168-175. Abstract. The scientific paper presents a structural, functional and performance study on a wide range of ultra high-tech robotic micro-nano-systems for measurement, positioning and alignment to optimize constructive solutions for applications in the field of Mechatronics and Integronics for technical, technological, industrial and precision nanoscale metrology processes. 10. FUNCTIONAL OPTIMIZATION OF THE EXPERIMENTAL RESEARCH STAND IN ORDER TO OBTAIN REACTIVE MIXTURES /Andreea KUFNER, Mircea VLADESCU, Alexis NEGREA, pp.176 -180. Abstract. The objective of this paper is to functionally optimize the experimental research stand in order to obtain reactive mixtures by changing the shape of the stirred tank reactor. The initial stand had a parallelepiped recipient which had the disadvantage of producing residual currents in the four corners of the reactor, having a negative influence over the intensity of the mixing process. In this paper there has been designed another reactor body, of cylindrical shape and bottom with section shape as a "basket handle'', which beside the fact that eliminates the above-mentioned inconvenient, it allows an increased efficiency of the mixing process, by eliminating the „dead” spaces and by optimally passing between the tank’s bottom and the lateral cylindrical part. 11. FINITE ELEMENT METHOD USED IN STRAIN AND STRESSES STUDY FROM ACTIVE PLATE OF PUNCHING USED FOR CUTTING OF MEDICAL DEVICES /Cornel MARIN, Gheorghe VASILE, pp. 181-187. Abstract. Permanent innovations in medical devices manufacturing technologies has as purpose to low their prices and improve the quality and efficiency of medical care. Shaped knives used for cut medical devices as polyurethane compresses are active elements in various forms and are part of automatic and semiautomatic punches. These stamps have a high price because of non-conventional processes used to manufacture them, and limited lifetime due to active wear of the edges is mainly due to uneven distortions arising from the application of these active elements. This paper work presents some theoretical and experimental research on deformation and stresses calculation of active plate of stamps 100 ? 100 mm, for a set of loading and border conditions. 12. STAND FOR LOW PRESSURE ACTUATORS. EXPERIMENTAL STUDY ON ARTIFICIAL MUSCLE, Simona MIHAI , Viviana FILIP, pp. 188 -197. Abstract. The purpose of this paper is the presentation of the experimental pneumatic stand in the laboratory and the experimental study of the pneumatic muscle behavior, as part of the stand, using FluidLab. The pneumatic muscle movement depending on the pressure supplied will be analysed and its modeling and simulation will be performed in SolidWorks. 13. NUMERICAL METHOD USED TO ANALYZE ZERO-ORDER AND THE FIRST ORDER KINEMATICS OF THE SWINGING-FORK MECHANISM/ Vladimir Dragos Tataru, pp. 198 – 201. Abstract. The paper presents a numerical method for kinematics analysis of zero order and first order of the swinging fork mechanism. For this purpose we first determine the differential equations describing the movement of the mechanism. These equations are written in the matrix form. Then, the system of differential equations obtained is solved using numerical integration methods. 14. NUMERICAL METHOD USED TO ANALYZE ZERO-ORDER AND THE FIRST ORDER KINEMATICS OF THE CARDANIC TRANSMISSION/ Vladimir Dragos Tataru, pp. 202 – 205. Abstract. The paper presents a numerical method for kinematics analysis of zero order and first order of the cardanic transmission. For this purpose we first determine the differential equations describing the movement of the mechanism. These equations are written in the matrix form. Then, the system of differential equations obtained is solved using numerical integration methods. 15. WHY 3D ROUGHNESS?/ Florian Traistaru, Danut Stanciu, Daniela Cioboata, pp. 206 – 211. -Is 3D roughness a necessity or just a caprice of the researchers? -There are only advantages when choosing to use 3D roughness? -When, where and why to use 3D roughness? It shows the maine differences between the two most important methods of measuring the roughness (2D &3D) and a system for measuring the 3D roughness using confocal microscopy and a high precision X-Y coordinate table. 16. CONSTRUCTION OF COMPLEX 3D SHAPES WITH SUPERELLIPSOIDS AND SUPER CYLINDERS/ Stefan TALU, Mihai TALU, pp. 212 – 215. Abstract. This paper presents a CAD study for generating of complex shapes with superellipsoids and super cylinders based on computational geometry. The Madsie Freestyle 1.5.3 application for computation helps in obtaining conclusions referring to shape and profile for different 3D complex objects, but also facilitate the design of new 3D models. Results from this study are applied in geometric constructions and computer aided design used in engineering and sculpture design. 17. COMPLEX 3D SHAPES WITH SUPERELLIPSOIDS AND SUPER CONES/ Stefan TALU, Mihai TALU, pp. 216 – 219. Abstract. The purpose of this paper is to present the results of a CAD study for generating of complex 3D shapes with superellipsoids and super cones based on computational geometry. To obtain the relevant geometric informations concerning the shape for different 3D complex objects the Madsie Freestyle 1.5.3 application for computation was used. The results of these study can be used in complex geometric constructions and optimized CAD structures used in engineering and sculpture design. 18. ANALYSIS OF HEAT EXCHANGER EFFICIENCY FOR AN ELECTRIC POWER TRANSFORMER/ Stefan TALU, Mihai TALU, pp. 220 -223. Abstract. The objective of this paper is to analyse through the Finite Elements Method (FEM) the efficiency of heat exchanger with forced cooling circuit by type oil-air RTCF 200 kW for electric power transformers. The Finite Elements Analysis was performed using SolidWorks 3D CAD Design and FLUENT 6.3.26 Software. A 3D model of the studied geometry was generated based on the designed data. The FEM results were compared with the results of tests carried experimentally. The obtained results offer important information for economical design of the power transformers to reduce the cost of manufacturing transformers. 19. MODELLING OF THERMAL PROCESSES OF A HYDRAULIC COOLING SYSTEM FOR A POWER TRANSFORMER/ Stefan TALU, Mihai TALU, pp. 224 -227. Abstract. This paper describes the Finite Elements Analysis of the hydraulic cooling system for electric power transformer by type TTU 630 kVA 20/0.4 kV. The Finite Elements Analysis was performed using SolidWorks 3D CAD Design and COSMOSFlow Works 2008 Software based on the designed data. Results from Finite Elements Analysis and experimental tests were compared. The obtained results offer useful information for optimal design of the electric power transformers to improve transformer efficiency, safety, reliability and to reduce manufacturing costs. 20. SEMIAUTOMATIC EQUIPMENT FOR MANUFACTURE OF POLYURETHANE DRESSINGS WITH ADHESIVE BORDERS UDED IN WOUND TREATMENT/ Gheorghe Vasile, Cornel Marin, pp. 228 -231. Abstract. Present technologies for current medical devices are one of the most innovative industries in the world. These devices improve and daily saves thousands of lives. Continuously innovations in medical devices manufacturing technologies have as result lowering of their prices and improved quality and efficiency of medical care. This study presents original equipment used in the manufacture of medical devices in the current context of diversification and specialization of medical devices.